Rain Go Away ABCs is a children’s learning app brought to us by Appbrella that focuses on teaching your child the ABCs. It costs $1.99 and can be used on an iPhone, iPod Touch, and iPad. Children oriented apps are popping up all over the place and I suppose they serve as a good distraction for offspring of overworked, busy parents. This app, in particular, is educational and not mind-numbing so I can live with the fact that it is electronic á la Leap Frog instead of an actual book to flip through. Each letter is paired with an illustration of something that starts with the specific letter, for instance A is coupled with a picture of an ant. If you tilt or shake the device the illustration becomes an animation complete with sound effects. Tapping on the letter is met with a voice reading it aloud and tapping on it twice makes the voice sound out the letter phonetically. There is a Tips option at the bottom right of the screen. This section is the part of the app that is for the adults because it encompasses suggestions for fun activities for the parents to get their kids into. An example comes from the letter V: “Silly snack time! Find the most colorful vegetables in your fridge and arrange them to make the funniest face you can think of! Try cherry tomato eyes and a bell pepper smile!” The tip sounds sort of like it was written for a child with all the exclamations and lack of insightful recommendations, but it is for a parent running out of ideas. When the alphabet starts there is a raining background, but as you progress to Z the sky clears up and the sun comes out. Buyers beware because I have heard stories of my friend’s kids deleting voicemails, emails, and text messages while they play on their parents’ phones. I do not have kids yet, so I cannot judge a parent for handing a phone to a child for entertainment or educational purposes, but I think I would draw the line at actually buying any person under the age of 13 a phone, iPod Touch or iPad. The bottom line is that Rain Go Away is a useful and productive way to teach your child his or her ABCs. 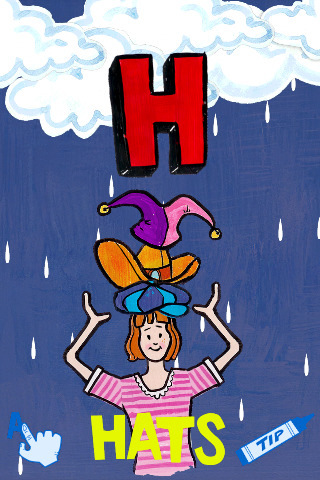 AppSafari review of Rain Go Away ABCs was written by Vanessa Paszterko on October 4th, 2010 and categorized under App Store, Education, Fun, iPad apps, Productivity, Reference, Universal. Page viewed 3639 times, 1 so far today. Need help on using these apps? Please read the Help Page.